Heather and Bonnie playing the training game. You're a good trainer Heather! encounter with our parrots, we are training them. Many times we knowingly train them, and many times we unknowingly train them. For example, if we open a cage door and offer our hand to our parrot and ask them to “step up” but they are reluctant to, we may be inclined to move our hand a little closer and ask our bird to “step up” again. If the behavior of not moving forward did not work for the bird the first time, this time he may step back. If we pursue and move our hand even closer, even though he stepped back, the bird may resort to more obvious actions to tell you they do not want to step up. These further actions forced from the bird may be an open beak with the presence of our hand. If when the bird opens its beak and we withdraw our hand, we have just taught it that the threat of a potential bite will get the bird what it wants if it wants to be left alone. This does not mean that a bird should never step up when we need it to, or that a bird has ‘run of the house’. When I ask a bird to step up, some of those times it is because I need the bird to step up. The other times are simply an invitation to be closer to me. If the bird chooses not to step up on the times in which I want to send an invitation for snuggles or play time, then that is the bird’s choice. When I need the bird to step up because I need to get to work or leave the house, then these are the times in which I make sure I arrange the environment to offer the bird’s choice a higher reward for doing the behavior in which I’m requesting of it, than for it not making that decision. This way I am arranging the environment for the bird to make a decision versus having that decision taken away from him, and allowing the bird to make that decision results in a consequence that is of value to him. If that consequence is of value, than his choice in choosing that behavior in the future will be more likely. This way, whenever I need my bird to step up and go back into his cage, he is likely to because the consequences of him performing this behavior rewards him something or many things of high value. This brings me to the topic of our last meeting. Monday night we played the game growing in popularity called “the training game”. This is a game intended on helping the bird owner better understand why, when, and how we, as bird owners, could be sending mixed messages to our birds. It is all based on a concept called ‘bridging’. Bridging is a term that defines a dedicated signal. This signal, such as a whistle, a word such as “good”, or the popular ‘click’ in ‘clicker training’ marks the exact time and the exact behavior that you, the trainer wants to reward. So, for example, you want to teach your bird to whistle and you are upstairs putting clothes away. Your bird is on the main floor in the living room looking out the window and playing with toys. 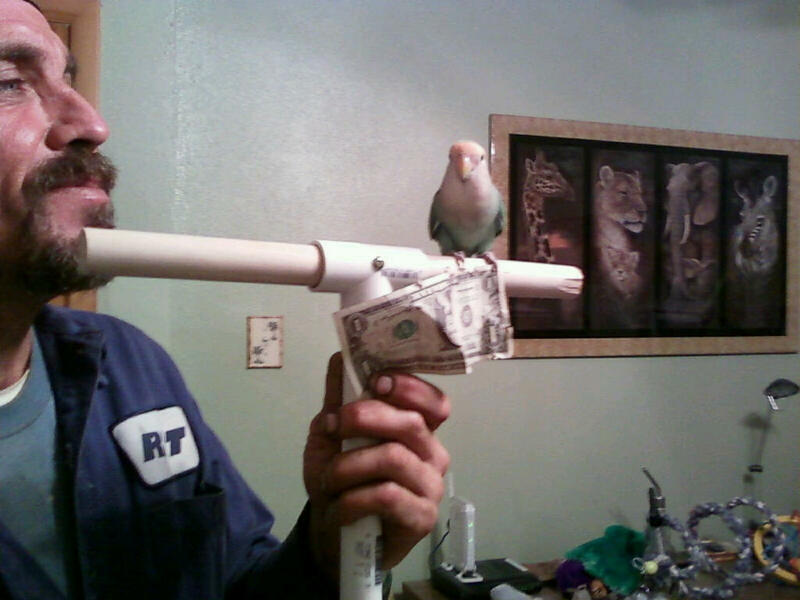 All of a sudden your bird throws out a whistle. By the time you drop the towels you are folding, run down the hallway, run down the stairs, run through the living room and into the dinning room to deliver the reward, Chico your Blue Crowned conure could now be preening his tail feathers. If you reward him at that time, Chico may begin to learn that preening his tail feathers gets him his reward. Whereas if you use a ‘bridge’ or a ‘marker’ this is a distinct signal, such as a ‘click’ or the word ‘good’ that marks the behavior, from a distance, that is earning the bird its reward. In the photo above, the behavior Heather decided to train Bonnie to do, was to pick up the jacket off the back of the chair and hang it in the closet. 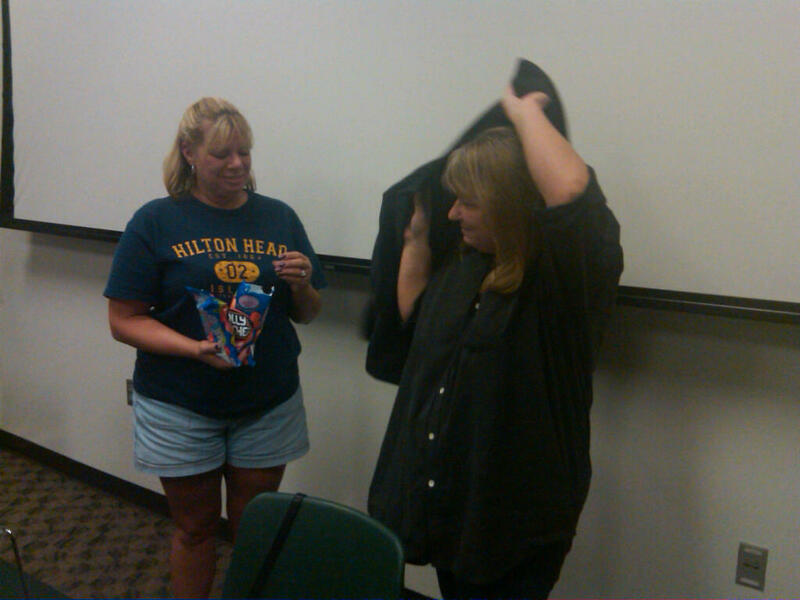 Heather rewarded Bonnie for the behaviors she wanted her to do while not rewarding the behaviors she didn’t want her to do, such as putting on the jacket versus hanging the jacket. Everyone that played was a good sport including Nikki and Sarah. Sprite, Bonnie's lovebird stepping onto the pvc perch she had made. One of the many other topics we covered were toys made of pvc. Both Heather and Bonnie had made toys or items of pvc that would help them with their birds in some way. Bonnie has taken in a rehomed cockatoo that she has been working with for almost a year now. Her cockatoo shows signs of being afraid of hands so Bonnie decided to make a longer perch for her bird to step onto. It’s a work in progress and she is doing an exceptional job in building trust with him. In the photo to the left you see her lovebird, Sprite, has taken a liking to the perch first. 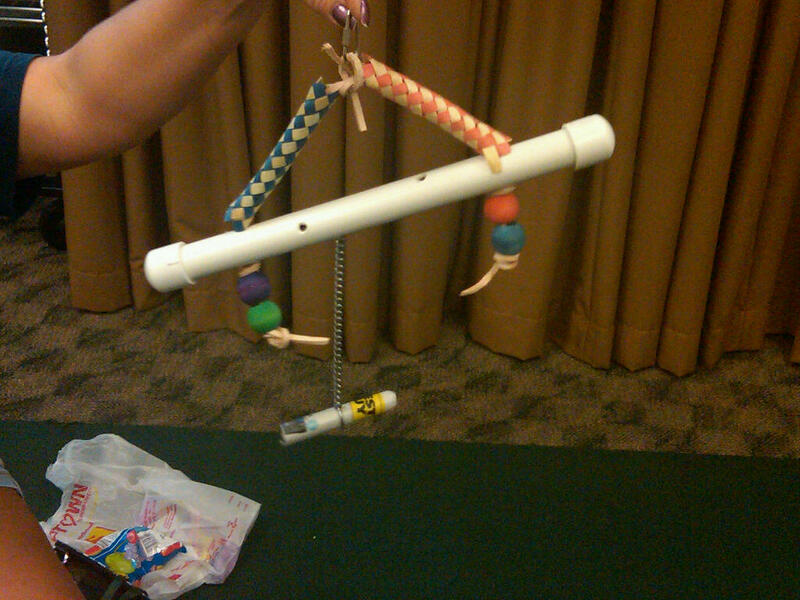 Heather's enrichment and foraging toy made of pvc. and a foraging toy. The holes in the pvc are to serve as a foraging device for her cockatoo while the rest of the toy functions as variable enrichment. The ends of the pvc come off to refill the toy. Both Bonnie and Heather won a $25 gift certificate to Pet Supplies Plus.